Nowadays I am nothing but mad about baking! 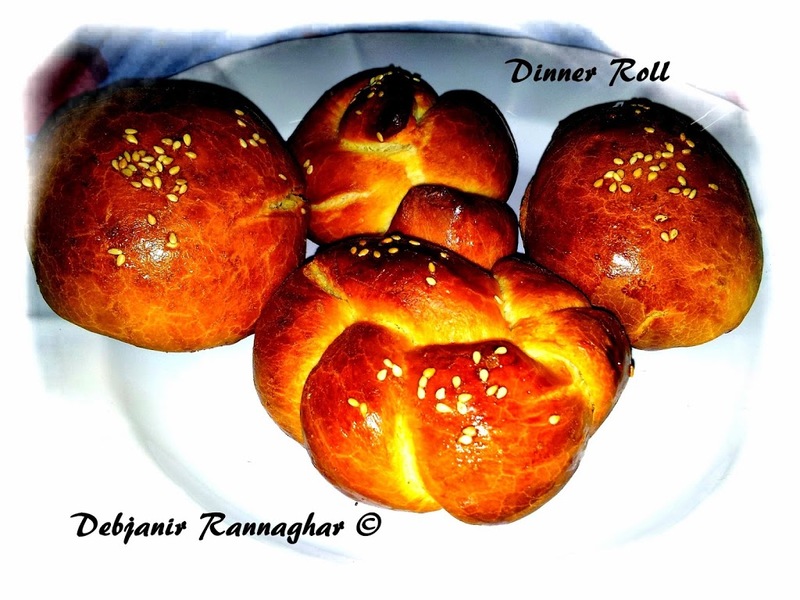 Especially something special that can be added to my little one’s plate… Pasta enjoys Sweet Dinner Roll or Buns along with warm milk a lot so I have decided to prepare those at home and believe me these Rolls are really easy to make and my end product was super yummy! Baking Dinner Rolls is a pleasure and my place was full of the aroma of freshly baked Dinner Rolls. My daughter loves her portion with milk and sugar and she ate it like Dudh-Pauruti which is a typical comfort food as considered by the bongs. Active Dry Yeast: 3 Tbsp. Take entire Yeast and Sugar in a bowl and add Milk and mix with a spoon and cover the bowl and give the mixture a rest of 10 minutes. Check the Milk-Yeast mixture after 10 minutes. 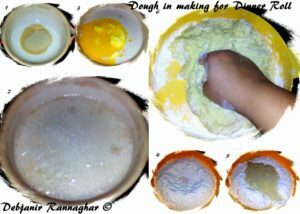 If the mixture turns foamy then it can be used unless the mixture has to be discarded. This step is the heart of making Soft Dinner Rolls. Next step is to mix 1 egg in the Yeast-Milk mixture. Now add room temperature Butter to the mixture and mix properly. Mix Salt with the Flour and then add the ⅓rd of the liquid to the Flour and start kneading and complete the kneading process by adding entire liquid. The end product after kneading for at least 12-15 minutes should be soft and elastic dough. Now cover the dough with a wet cloth and give it a rest of around 1 hour in a warm spot. The dough will be turning double in size after the resting time. Now again knead the dough to remove all the air formed within the dough for around 1 minute. 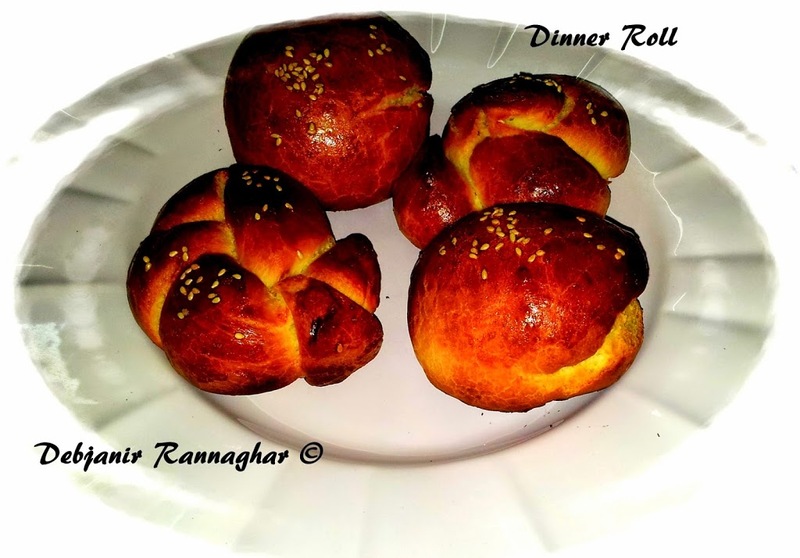 I have prepared rolls of 2 different shapes: one is normal Round Roll and another is the Knotted Dinner Roll. 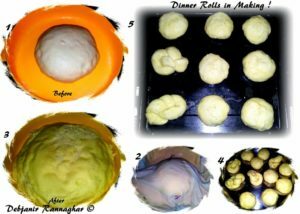 To make Round Rolls take one portion of dough and make Round Dinner Rolls using your Palms. Take one portion of dough and make a 12” long rope using your Palms and make a knot of the rope to prepare the Knotted Dinner Roll. Now Place all the Dinner Rolls in a Baking Tray. Beat one Egg to prepare the Egg Wash and brush all the Dinner Rolls with the Egg wash and cover the Dinner Rolls with a wet cloth and give a rest of 15 minutes again. Simultaneously Preheat the Oven in 1700 C for 10 minutes. Bake the Dinner Rolls for around 20 minutes in the middle rack. Do check after 15 minutes of baking since every oven is different. After the baking take the Dinner Rolls out of the oven and brush them with little butter and give those a stand of around 15 minutes before serving. This step is crucial as the Dinner Rolls need at least 15 minutes after baking to turn softer in texture.